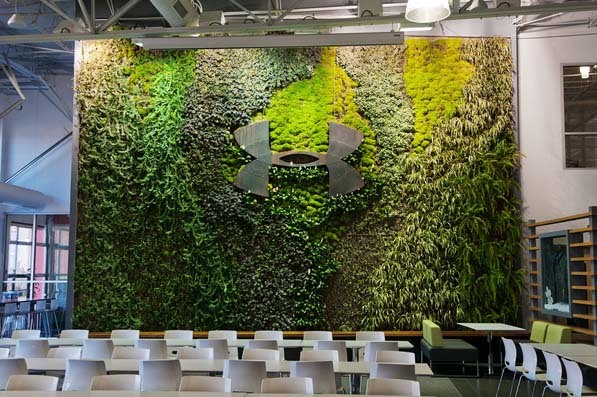 In addition to making Under Armour’s work spaces more adaptable and scalable, Neil Jurgens, the vice president of global corporate real estate, is figuring out what perks workers want, including green walls. This one is a part of the company’s main Baltimore campus. It’s the largest indoor living wall in the region. Under Armour’s footwear-development office, completed in 2012, has low, open bench workstations and collaborative meeting spaces, all lit by ample daylighting from floor-to-ceiling windows. Under Armour, a $2 billion-a-year sports-apparel company with its own chain of stores and high-profile sponsorship deals, might not at first seem like an underdog. But, when compared to seasoned veterans such as Nike or Adidas, which have decades of experience and exponentially larger revenues, the rookie clothier, founded in 1996, begins to look like more of a long shot. So, to challenge its heavyweight counterparts, Under Armour is actually embracing its youth, channeling a staggering 20 percent of its rapid annual growth into flexible facilities made to withstand the changes of the business landscape. The Station House, Under Armour’s reception area, is the entrance point for all visitors to the company’s main campus. The 4,500-square-foot building has two floors with food, drinks, and entertainment. At heart, Jurgens is a builder. After getting a degree in civil engineering, he spent eight years in Baltimore, working in general contracting and construction management before joining Santa Monica, California-based Macerich in 1997. There, he did retail development work for 10 years until Disney came calling in 2007, putting him to work on real estate, construction, and asset management on a global scale. Under Armour’s CEO, Kevin Plank, drew Jurgens from Disney with his vision of intense growth. Plank wants to build Under Armour into a $10 billion-per-year company by 2020, and Jurgens felt he could leverage his international experience to help with the ambitious plan. At its simplest, Jurgens’s role is to understand what real estate Under Armour needs then provide options that lead to informed decisions. Jurgens examines how employees work and communicates with teams on the ground to figure out what spaces, features, and initiatives function well and what don’t, whether they’re “as simple as keeping the lights on and keeping the place clean [or, more complexly,] creating spaces and areas for people to work in and interact,” he says. Jurgens and his team are now studying how to make Under Armour’s workplaces scalable and flexible in preparation for the company’s planned expansion. And, along the way, Jurgens is getting a little help from M Moser Associates, a global company specializing in architect-led design-build solutions for workplaces. The firm worked with Jurgens during his tenure at Disney (helping him complete approximately 800,000 square feet of office space), and it is currently assisting with an Under Armour sales office in Guangzhou, China. In 1996, with his grandmother’s basement as company headquarters, 23-year-old CEO Kevin Plank spent his first year of business traveling the East Coast, selling his HeatGear T-shirt, named the #0037, from the trunk of his car. By the year’s end, he had made his first team sale. Having garnered recognition through its involvement with the movie Any Given Sunday, partnered with professional sports teams, and launched its “Protect This House” TV campaign, the company went public in 2005, and its size increased exponentially from there. The planning of each new Under Armour space starts with a visioning process that determines how it will function. Designing a space that allows flexibility while minimizing vacancy means understanding how the different groups using the space—be they from sales, accounting, design, etc.—will work, then optimizing the workplace standards around their behavior. Jurgens’s designs recognize the effects of employee density on productivity and morale, but they also factor in the economic realities of real estate. Jurgens recalls an exchange with one senior executive who wished to get rid of his office entirely because he never used it. Instead, Jurgens replaced the space with several high-top tables where the executive could sit and interact with his teams constantly. This type of focus on employees’ actual functions and behaviors, rather than on traditional norms, is what drives Jurgens’s work. As Under Armour knocks down walls to create more open, collaborative workplaces, it’s actually creating tighter workplace standards by enhancing teamwork and increasing accountability. The strategy involves many details, such as the precise positioning of office pantries to create better opportunities for workers to bump into each other and begin impromptu collaborations. Under Armour’s promenade is one of the signature amenities of the company’s Baltimore campus, with a turf field—painted with the Maryland flag—for outdoor exercise and activities.